Uh oh, spotted a fawn not too far from the garden. My neighbor said he saw 4 the other day so I suspect they’re in near residence. I saw a few last year and in a couple of instances, actually saw hoof prints inside the garden but they never decided to chow down, even on the corn. Maybe they don’t like the taste of caterpillars that are eating high on the tomato plants. Fingers crossed against a Bambi attack. Trying a low probability experiment with summer growing by planting a short row of carrots that are labeled as heat resistant. I mentioned that I had just picked the last of the carrots and those were also this same particular variety, Nelson. I have a narrow row that sits between the corn and the pole beans so it’s almost completely shaded and should remain that way for another month or so – I’m thinking enough time to let the carrots start. Along this same row and with the same strategy in mind, I planted cabbages in early March – very late for planting them here. I picked the first of those today so keeping them out of the direct sunlight has worked so far. A few weeks back Tom brought us a jar of spicy pickles that he’d picked up at a local Farmer’s Market. They were really good (as advertised) and I decided to try something with the brine when the cucumber based pickles were gone – replace the cucumbers with slices of radish, kohlrabi, and spring onions. That was a couple of weeks ago and we opened the jar today. Incredible!! I like them better than the original because of the crispness. Really enjoyed the kohlrabi this year, mostly in salads and now pickled so I’m going to expand that crop next fall. We have plenty of taker for the leaves which apparently taste similar to collard greens and the tubers that I use, keeps for a really long time in the fridge- months – and tastes just as good as fresh picked. I had to renew a credit card and had an interesting experience. I dialed the 800 number and the robot voice instructed me to enter or say the card number, one digit at a time. Not sure how you can do it any other way. I started laughing trying to think how to do it two digits at a time and the whole process timed out. Next month is travel month. I’m going to Alabama on a fishing trip with Tom and Simon and Nancy is going to Salt Lake City. Of course they’re burning and looting in Baltimore – why would you expect anything different? And they’ll live in burnt out neighborhoods with no services for years – makes sense to me. At least the liquor stores are quick to rebuild and restock. I know it’s boring to keep showing corn pictures but that’s the most exciting thing going on in my life right now. This stuff grows so fast that it truly amazes me. In the last few days it’s grown over 6’ tall and is loaded with forming ears, silk and tassels. It’s not scheduled to be ready for harvest until May 18, in about 4 weeks. 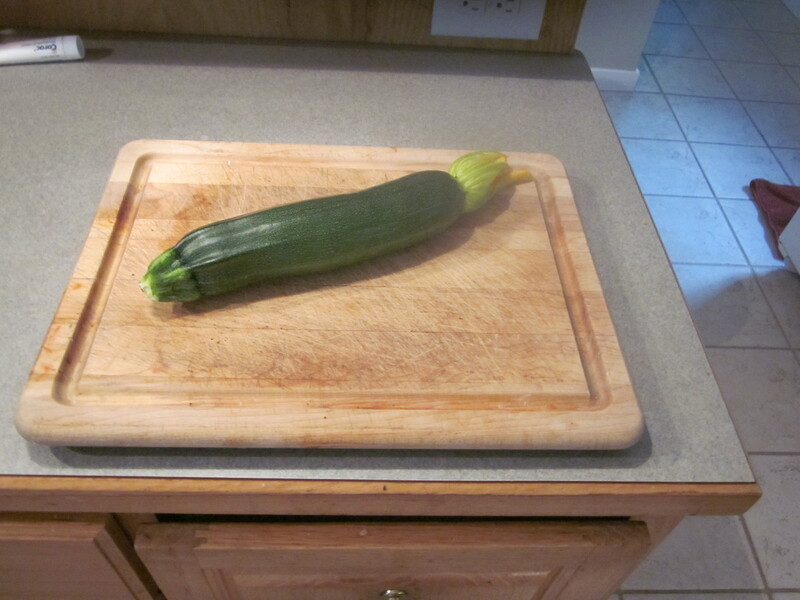 The zucchini is also mind boggling in terms of growth speed. A 3” long squash becomes 6” long overnight and will turn into a log if I’d let it go a week. According to the planting log, the squash should be ready April 24 but by the 23rd, I had already picked 8 – it was running more than a week ahead of schedule. How about this – I planted the green beans on March 4 and picked the first batch today, April 23 – roughly 7 weeks from seed to beans. That seemed really fast to me so I checked it with my planting guide and it predicted they’d be ready April 25 so they’re pretty much on target. If you pick these veggies, squash and beans, when they’re ready, the plant keeps putting out but if you let them go unpicked, the taste suffers and the plants quit producing much earlier. Normally we’re at the beach this time of year and that presents a real problem in terms of optimizing the yield. I also picked the last of the carrots, a dozen or so. No fresh carrots now until next January. Ditto the butter crunch lettuce, Nancy’s favorite. The lake level is close to the highest in a couple of months and much higher than normal after the “dry” season. The wet season officially starts next month and we’ll be entering that almost full. That’s not good from a garden standpoint. I had trouble last year with rotting roots so unless we have a drier than usual wet season, I’m probably going to have the same problems. We need an XL pipeline between here and CA. In general the plants are further along this year because of a milder winter so we should still harvest plenty in May but maybe not much beyond that. Corn is head high and loaded with tassels. My projection is for picking starting May 18 and things look right on target. Also have blossoms on the pole beans so mid May for them seems right too. Ditto jalapeño peppers. As a follow up to using detergent to ward off the boring bugs/caterpillars – nope. The only approach that seems to work is literally examining the tomato bushes meticulously and squashing the bugs by hand. At the beginning of the week I know I was squashing a 100 per trip to the garden but by the end of the week, maybe half a dozen. So maybe I’m getting on the right side of the control curve. Blueberry season again. Nancy goes by a blueberry farm on her way to bridge and picked up 12 lbs. We freeze them in quart size freezer bags and use in cereal or whatever else calls for blueberries. 12 lbs sounds like a lot but I’m guessing we’ll get another batch that size before the season ends – mid May. We pay $4/pound. To calibrate you on local Publix pricing – a 6 oz container is $5 so this is less than half. If Nancy had gone the extra mile and picked them herself, the price would have been $3.50. I’m fairly sure had she gone the U-pik route, 12 lbs would have been reduced to 1. I took the next step by putting the kayak into the lake and making a stab at catching some bass. I was going to catch a big one but decided to take it easy and only catch small ones. No problems so I’m ready to up the game to try for snook at the Tomoka River soon. 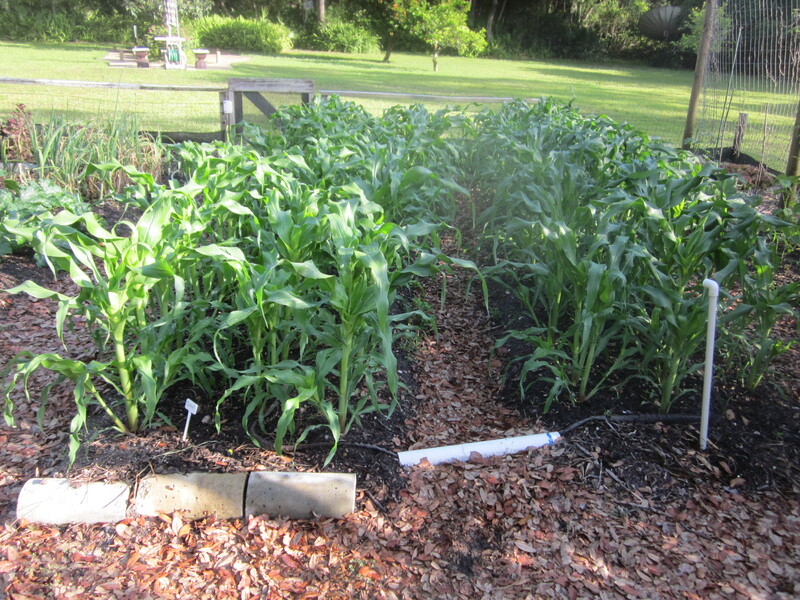 Late Breaking – Ears of corn starting to show! Did the first follow-up visit after the stent installation. All’s well, no problems and he said I could resume normal day to day activities. I explained that involved kayaking, fishing, digging and lots of upper body activity and he assured me that none of that will bother the stents. He also confirmed that I could eat leafy greens and that they were, in fact, good for me. The leafy green cautions are valid with some blood thinners not including Plavix. No problems with grapefruit either so I can resume my standard dietary patterns. To prevent future blockages he prescribed a statin, Crestor. Crestor is another of those drugs that you see advertised on TV that goes on forever about the side affects. I have a supply of samples to try just in case they don’t agree with me. Most common side affect is muscle pain. So far, so good. The only negative so far came when I was out checking the garden yesterday and happened to look up. There were three buzzards circling a couple hundred feet up. Do they know something I don’t? Check out the corn. It’s gone from knee high to almost waist high in two days. Starting to see some tassels forming – same day the recently planted corn seed started germinating. Because most everything organic ends up in the compost pile, I get renegade, unplanned plants, sprouting up from time to time. Mostly these are tomatoes but sometimes include basel, parsley, an occasional eggplant but this year potato plants are popping up all over. I pull them out and sure enough they’re attached to a piece of potato peeling so I guess sometime recently we had mashed potatoes and dumped the peelings onto the compost pile. There are a couple of vine veggies that I recognize as either squash, cucumbers or melons. They popped up in a place that could perhaps support something if only I knew what they are. Melons really get long vines so they can be very intrusive and so far, in my garden, unproductive. If I knew they were from a variety I had previously planted, I’d just yank them now but it’s quite possible they came from the remains of a store bought melon. Both us and the neighbors add melon rinds and seeds to the mix sporadically throughout the year. Right now I’m leaning toward letting them go for a while. Tom and his family came up for Easter din din last weekend and I picked up an interesting fact that you might need. Tom had some car problems and left his Jeep at the dealer for repair. A day or so later, Tina drove the loaner to the dealer to pick up their car. The service people called for a valet person over the PA system who never showed up. Tina decided to go find the car herself but found herself in a large lot with lots of cars that looked just like theirs. She tried hitting the alarm fob to elicit a beep from the car but nothing happened. About that time a guy who worked there drove over in a golf cart. She explained her plight and the guy took the fob, held it under his neck and pushed the button. The car beeped quite a distance from where they were. He explained that somehow holding the fob in that way used your body as an antenna and extended the range. Sounds weirdly plausible and Tina was an eye witness so it must work. I started this day exactly like I did a week ago. Let’s hope it doesn’t end up the same. I did a little work in the garden, same today, and it all came crashing down about noon. Nancy asked me this morning if I felt much better than I did then and I had to admit that I felt exactly the same – no hints at all last week. I have been taking it easier for sure but gradually doing a bit more each day. I put off the stuff I have always looked for excuses to put off – aka mowing the weeds. I meet with the doc on Friday and get his assessment of my status but I suspect it will be just fine. The big bummer so far is that the beach vacation is off. The consensus thought was that it would be too strenuous so soon after the stent installation. The bluefish are in the surf big time so I can see the wisdom in not tangling with them. Also, surf fishing is a full body event; walking in the soft Flagler sand can be taxing; there are a lot of stairs to be climbed getting in and out of the place and up and down to the beach. Bummer. It would have been way better for this whole thing to have happened in mid January. George came over this weekend to check on my health status and left Harley, his pooch, outside. Turns out Nancy had placed a package of frozen chicken thighs out the back door to defrost. You can fill in the blanks. 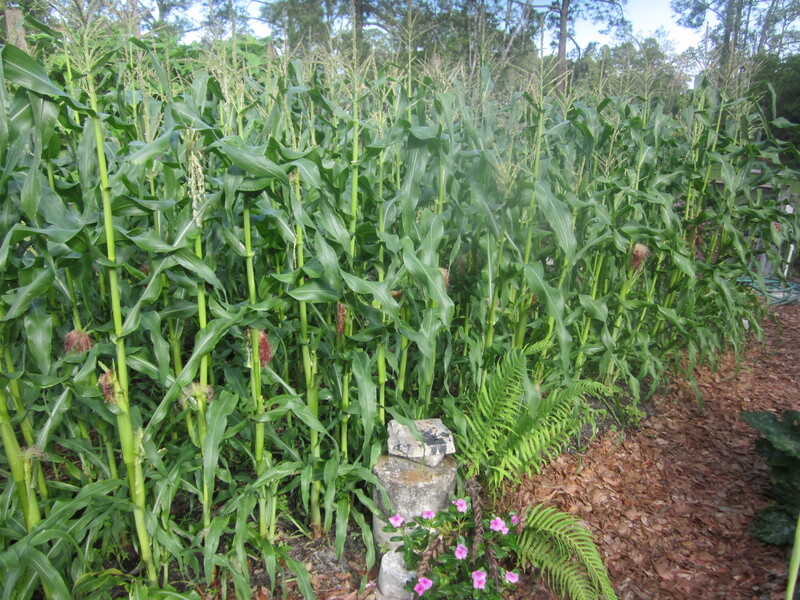 The corn is looking really good, in my recollection the best ever (so far). The plants are knee high and really strong looking. Last season the plants grew taller faster but looked skimpier; not as strong and the crop was just not good. It looks so good that I’m going to plant a few more rows, maybe another 50+ plants. It’s a little late in the season but you really never know and I have the space and seeds available so why not try. Worst thing that can happen is that I end up growing compost, not corn. And there are baby cherry tomatoes on a couple of the bushes so I’m amped about that. Ditto a couple of tiny zucchinis and the pole beans are climbing their little hearts out so we’re off and running big time. I have a batch of egg plant seedlings ready to move to the garden and the spot is cleared and ready for them. Rain is forecast for Saturday so I’ll wait until then to do the big move. And still picking lots of kale, lettuce, and other greens – mostly for others. I’ve been getting mixed messages about whether or not I should be eating greens so I’ve backed off until the doc meeting. Ditto grapefruit. I received quite a load of literature on dealing with heart things on discharge and the only dietary restrictions seemed to be to avoid fatty foods. It looks to me like I’ve been doing all the right things, or nearly so, for quite a while. No smoking, losing some weight and cutting butter is a pretty good summary of the official line and I plead not guilty to any of that. One of the nicest things about this time of year is that the grapefruit are fully ripened and at their sweetest. They literally fall off the tree, a dozen or so every day. I scoop them up and convert them to juice every day or so. By the end of April I will have consumed gallons. Somebody told me you’re not supposed to drink grapefruit juice if you are taking meds but……………. Also, I don’t think that counts if every once in a while one of the drinks is spiked with vodka. I hadn’t tried using grapefruit juice in a green smoothie yet so it seemed like the natural move – great. I added the juice from 2 small grapefruit to the next creation and it gave it a zing heretofore missing. The ice maker is seriously fixed. It is cranking out cubes now faster and better than ever. In fact the rate at which it’s dumping out cubes seems to be accelerating so it must be that it takes a few days for the whole system to chill down. I fixed it Saturday afternoon but by Sunday afternoon, it had only cranked out a few, wimpy looking cubes. After our company left, I took it apart again to make doubly sure that I had done everything right before we just called a repair guy. By Monday morning there looked to be a few more cubes than it had after the first repair but still far short of anything you’d expect. By Tuesday morning it seemed to be accumulating cubes at a useable rate – not as fast as expected but maybe ok. By Wednesday morning, the holding tray was filling up and it was dumping out new cubes every few hours. Now for the news or why the gap in postings – this was one of the worst weeks in memory. I woke up Wednesday and all was well but by Thursday afternoon I was in ICU with two stents installed somewhere in my chest. I normally get up and walk to the paper box and mail box – about 500’. On the way back to the house I started feeling a tightness in my chest and felt a little tired. Nothing scary but definitely noticeable. An hour or two later I carried a bag of trash up to the utility shed, about 250’ and felt the same tightness in my chest and tiredness. My diagnosis, I need to get more sleep. An hour or so later I went over to the garden and buried several fish carcasses that my neighbor had donated and noticed that my hand started hurting with just a minimal amount of digging. I finished that and carried the empty plastic bags up to the trash. On the way back to the house I felt the tightness return but it turned into serious pain and the tired feeling changed to down right exhaustion – like lay down kind of tired. The earlier events had cleared up after a few minutes, this one got worse and I was fairly certain it was a real problem. Nancy was off in Crescent City playing bridge so I called my neighbor and asked if he’d mind driving me to the emergency room in Deland. Five minutes after walking into the emergency room I was giving blood and being assigned to a room in the observation area for an overnight. The first blood test turned into a series of 3 where they look for some enzymes that tell if you’ve had a heart attack. By then the pain had gone away and I was pretty sure this was an over reaction, a false alarm but my neighbor’s wife had gotten in touch with Nancy so it was disrupting her game. Next Joey showed up, then Tommy – Nancy had called them on the way to the hospital. I really felt like a jerk for uprooting their day. The first of the 3 blood test results came back with no problems. I still felt good about 9PM when the floor nurse came to give me a pneumonia shot – they told me I was behind and as long as I was there, why not catch up. The instant she inserted the needle I felt the pain in both arms again, actually the thumbs on both hands, and the chest pressure started. It lasted about 20 minutes and was an order of magnitude worse than the pain that brought me there in the first place. They put a nitro tablet under my tongue and the pain quickly dissipated. The next two blood tests came in, also negative, but they decided to order 3 more based on the last episode – guaranteeing a night interrupted several times by Vampira, the blood lady. She was scary – good looking blonde with a heavy Russian accent. First thing Thursday morning I went down for a nuclear stress test. There they inject you with some evil stuff, not a problem, and then run a half hour scan to get pictures of your heart unstressed. Then you get on the treadmill to get your heart rate up and finish back on the radiological scan machine. I made it about a minute on the treadmill before the crushing pain started again. They stopped the test and rushed me back to the scanning equipment. I’m in much pain and they’re telling me to lay still so the pictures will come out good. I asked about nitro and someone popped one in my mouth and things calmed down in a few minutes and the test was finished. From there, wheeled off to the cath lab for a heart catheterization. I think it was about noon by then and Nancy, Joey, and Tommy were all standing in the wings watching this whole event materialize. Turns out I had two blockages, one 95%, one 90%. They put in stents and I was back in the ICU by 2PM. Uneventful night other than frequent blood lettings. I was released Friday; home by 4PM. Got a good night’s sleep Friday night, and as of Saturday noonish, all’s well and I’m nominally back to routine including my morning walk up to get the paper and mail. So far, so good and it looks to me like the biggest change is getting used to taking a blood thinner – one of those you see on TV where they spend 5 minutes telling you all the bad things that can happen if you take it. Net of the whole thing is that I didn’t have a heart attack but will probably be on this nasty medicine for a while and carry some nitro with me. One thing I found interesting was that I was having an angina attack while on the treadmill, hooked up to an EKG machine but my heart rhythms were just fine – nothing showed abnormal on the machine. Also all the testing showed that my heart, as an organ, was just fine – doing everything it’s supposed to in a strong fashion.